Who would think a little boy would die as a result of this childhood illness? And just after his first birthday. 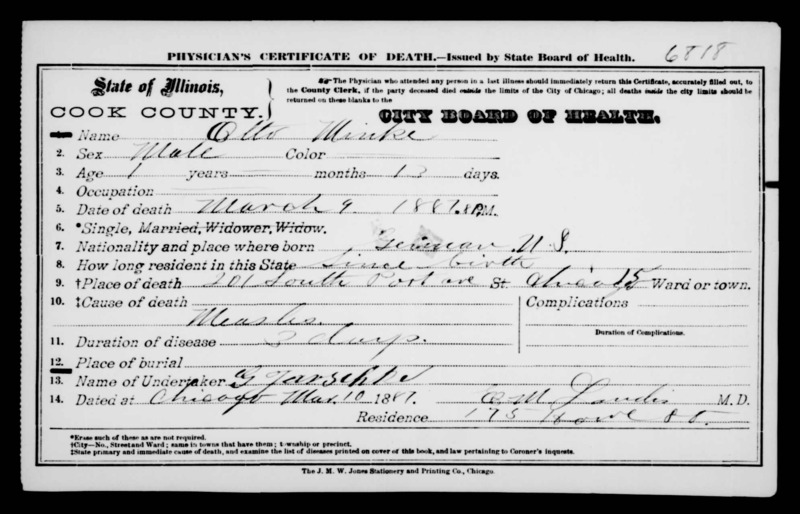 Otto Minke’s birth and death were recorded in Chicago records on FamilySearch, but his place of burial is not. I’m not related to the Minkes, but I would like to solve the mystery of where this child was laid to rest. Can you help reunite this baby with his family here or on Find A Grave? Thank you for taking a minute or two to honor this short life. According to his birth record, Otto’s parents were Charles Minki and Rika, nee Pankas. Rieke Minke died 7/25/37 and according to her death notice in the Tribune is buried at Rosehill, so that’s my guess for little Otto’s resting place. Interesting that her death notice does not mention Charles or Otto but does mention children Emma and Bernard. In the “old days” measles was among the most common causes of death of children.